China has grown its economy for the past 10 or more years by building infrastructure: roads, high-speed rail, ports. Many well-connected Chinese enterprises made huge money from these projects. As the infrastructure in China produces declining returns, the Belt and Road gives China’s infrastructure firms a way of going abroad. 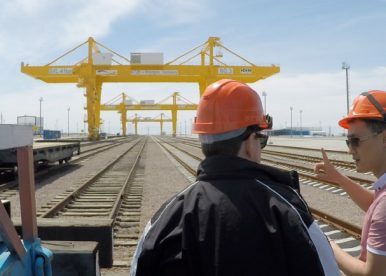 The big names at home — the Gezhouba Group, the China Railway Group, and the China Communications Construction Company, for example — become the big names in the Belt and Road, using government capital and projects abroad to fuel business growth. In the end, the Belt and Road is an outlet for too much investment capital and Chinese firms desperate to keep the economic engines of China revved up. What about forging new routes to Europe and Southeast Asia? Yes, there will be new ways of getting from China’s manufacturing centers to Europe, but there as of yet there are not signs that these routes are either economically practical or viable. Rail from China to Europe is interesting, but not much has started to flow yet. Shipping still offers significant cost advantages: trans-shipment opportunities, cheaper unit costs, and easier coordination. Accordingly, major investments of the Belt and Road expand ports and terminals mainly for Chinese goods. We’ll hear some huge numbers at the Belt and Road forum next month; best to take them with more than a grain of salt. So even if we give the Chinese sources some benefit of the doubt, a reasonable estimate of the flow would be $15 billion to $25 billion per year. Global infrastructure investment lags sorely behind the need. The World Bank estimates a shortfall at over $1.3 trillion per year for infrastructure in emerging economies. Countries want infrastructure and are happy to have a new road, rail line, port, or factory, often without reading the fine print or caring sufficiently about repayment terms. Stories of bribery are rampant. A growing number of countries –Myanmar, Malaysia, Nepal, and Pakistan, for example — have succeeded in forcing renegotiation or cancellation of particular Chinese projects. More and more leaders now pay closer attention to the terms of the deals. Identifying actual disbursements and total amounts is difficult, but when you add in local financing and projects around the world, much of the new money in infrastructure will come from the private sector. Indian infrastructure, for example, absorbs major investment from the private sector. India’s government identifies over $450 billion in over 3,000 public-private infrastructure projects. All in all, the private money adds up in India, in Southeast Asia, in China, in Belt and Road countries, and elsewhere in the developing world. China constitutes part of the private investment trend, both as a recipient and an investor, but China by no means dominates global infrastructure. Belt and Road has been compared to many things, most of them inaccurately. First, the “New Silk Road” — a poetic Chinese phrase. The old Silk Road moved goods from China to the Middle East, and some on from there to Europe; to this extent goods will indeed move from China to far off lands. But there the similarities end. Unlike the current incarnation, the Silk Road did not extend Chinese presence or traders into foreign places. Over the old Silk Road, goods moved from hand to hand: caravans went to the edge of China with Central Asia, where Sogdians and Turkic horse traders brought them to the Persian and Arab empires, from which Persians and Arabs sold them onward. Everyone along the way had a stake in the trade. Contrast this with China’s Belt and Road, largely focused on projects operated and built by Chinese firms with Chinese labor, with much of the money and profit going to Chinese firms and banks. What about the “Chinese Marshall Plan”? It’s not that either: the Marshall Plan was financed through and for foreign partners. While U.S. contributions were recognized in most places, the operational side was local — even to the point that the French government, at times, refused to advertise projects as financed by the Americans. The Marshall Plan brought machinery, goods, and food to Europeans who rebuilt their own economies. Contrast that with the Belt and Road which normally involves Chinese firms and workers building projects in foreign lands and often does little to build local capacity and sustain development. In fact, it’s debatable to what extent the Belt and Road is actually a new phenomenon. The Belt and Road largely involves a massive rebranding of existing projects to please the leader. For example, Gwadar, the port built in Pakistan from 2001 to 2007, became a centerpiece of Belt and Road with Xi Jinping’s 2013 announcement. As Chinese wages go up and the global middle class expands, Chinese and foreign firms operating in China have long been looking overseas for new middle-class markets and new workers. Today, any Chinese investment almost anywhere in the world becomes a star in the Belt and Road firmament. From shoe factories in Ethiopia to auto production in Hungary, whether begun under the earlier “Go Out Policy” of 1999 or after Xi’s 2013 announcement, everything gets tagged Belt and Road. Yes, there are elements of strategy in the Belt and Road, but more domestic development strategy than international. China’s infrastructure projects mainly focus on bringing raw materials to Chinese industry and moving Chinese goods to growing markets in Southeast Asia, Africa, and Europe. Some aspects provide strategic benefits that are interesting, but not game changers. The major axis of infrastructure in South and Southeast Asia will give China routes through Myanmar and Pakistan, including pipelines for oil supplies and railways for goods and eventually tourists. The premium on Myanmar and Pakistan for Chinese planners comes from the fact that these routes avoid the Straits of Malacca, the tight bottleneck between Singapore and Indonesia which the U.S. Navy frequents and where the bulk of China’s oil and other supplies pass now. It is doubtful that a significant portion of this dependency can be shifted, but China seeks alternatives as it also seeks to establish its presence in the South China Sea. Another strategic aspect involves Central Asia. In the “Great Game” of the 19th century, the Russian czar’s army and railroads pushed out residual Chinese influence as well as Western encroachments. Now, in the 21st century, Chinese traders, investors and infrastructure are returning to an area where they have been largely absent for over 100 years. Still, U.S. and European governments and investors remain the primary source of global capital both public and private. A Western presence offers opportunities for developing countries to balance out the Chinese offers. While U.S. public money focuses more on humanitarian projects than infrastructure, the growing role of private finance provides this alternative. Indeed, U.S. and European firms and governments can help recipients of Chinese flows demand more transparency and better terms. As the Trump administration recognized in its underfunded Indo-Pacific Initiative, the Western alternatives at the very least strengthen the hand of developing nations in negotiating with China. China’s economic development and its accumulation of capital were bound to spill over eventually into the world economy. The Asian development model — import machines and inputs, build an export industry, and accumulate assets — has already been followed by others, including Japan, South Korea, and Taiwan, who became overseas investors. Now that China has built a hefty bank balance and saturated its domestic infrastructure needs, why would China’s money managers leave their money in U.S. treasuries when they can lend it around the world to create Chinese profits and jobs? Just as with waves of U.S. and European investors in the second half of the 20th century, money goes into countries that supply raw materials and provide new markets. Many of these projects won’t pan out and some will go bust, but many others will take root. China, like its Western predecessors, now stands as a global player but not a dominant force. Next month’s Belt and Road Forum will produce lots of big numbers and hoopla. Perhaps it will also provide some additional transparency and openings for local involvement. As we watch, we should all be skeptical of the reality and not tremble at the sound and fury of the occasion. The Belt and Road makes China a player, but not the biggest nor the only new player in the game of international finance. Richard Boucher, who achieved the rank of Career Ambassador in the U.S. Foreign Service, is a long-time China hand and former spokesperson for the U.S. State Department.